and I will love you every moment of mine..."
Please allow me to extend my sincere sympathy as you grieve the loss of your child. Holy Mother Church grieves with you in your loss and offers prayers for your child, for you and for your whole family. The disappointment, pain and grief that come with the loss of a child, whether born or unborn, constitute a genuine trial for parents. The church desires to walk with you during this difficult time. With hope and trust in God's infinite love and mercy, may you be consoled as as you persevere in the pilgrimage of life in anticipation of reunion with your child and eternity where every tear will be wiped away. 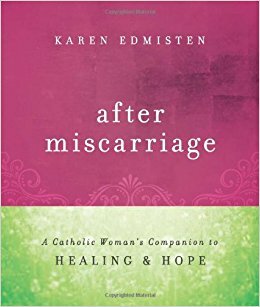 Along with your parish Pastor, I offer the Miscarriage and Early Infant Loss: A Guide for Parents and the other materials to assist you as you confront your loss and make plans to commend your child to God's infinite mercy and love. I pray that you will find them helpful during this most difficult times. May the God of all consolation bless you with strength and peace. May the Blessed Virgin Mary, who grieved over the loss of her own Son, embrace you with her loving prayers. You can click on the image for the Amazon link. Do you want to speak to someone who has been through this? Contact our Pro-Life office at prolife@archkck.org to connect with another mentor Mom in our Archdiocese!